This made him a noted sceptic, as the scientific consensus then was that the world was rapidly cooling. The news media worldwide were running horror stories, demanding that governments “do something” about the impending ice age. Undeterred by his contrarian status, Salinger began work on a PhD thesis dealing with the New Zealand temperature record (NZTR). Faced with more than 100 years of NZ Met Service temperature records that showed no sign of warming, he devised a novel method of “adjusting” the data by using inter-station comparisons. An appendix to his thesis claimed that the adjustments in a ‘Seven-station Series’ (7SS) disclosed a strong 125-year warming trend. In the late 1970s, Salinger presented previews of his warming theory at scientific conferences. Unconvinced, senior Met Service meteorologists undertook a careful analysis of New Zealand’s long-standing weather stations, finding that many were seriously contaminated by urban heat island and shelter effects. A landmark journal paper showed that the reliable stations had recorded no warming at all during 1930-80. Hessell (1980) was published just before Salinger was to present his thesis at VUW. What to do? Jim Hessell was the doyen of the New Zealand profession, whilst he was a mere student. The Hessell paper had been independently peer-reviewed and accepted for publication in a scientific journal of international standing – whilst Salinger’s efforts were no more than the personal opinions of a student. He pressed on, without engaging with Hessell. The 7SS and the claimed warming trend was only an appendix, and the thesis was wide-ranging. And anyhow, neither of his assessors was a meteorologist. Dr Salinger then went to work for Professor Phil Jones at the CRU, in the University of East Anglia, UK. During the 1980s, Jones and his associates were at the forefront of developing the nascent science of anthropogenic global warming (AGW), and establishing the foundations for the IPCC. The CRU group led the world in evolving new methods of homogenising historical temperature records, and Jones and Salinger were co-authors of several journal papers. The early 1990s found Salinger back in New Zealand with the Met Service. Jim Hessell had now retired. Salinger and colleagues won a grant from FORST to fund research on the NZTR. This yielded Rhoades & Salinger (1993), a peer-reviewed paper providing a comprehensive discussion of the homogenisation of temperature records, including statistical techniques for identifying and justifying adjustments. The Met Service group also prepared an internal paper, Salinger et al (1992), based upon a 24-station temperature series, which showed strong warming in the 1950s and 1980s. This was apparently prepared with adjustments taken from the 1981 thesis, and possibly tested with other methods – but it no longer exists. During 1992, Salinger transferred to the new Crown Research Institute, NIWA, as Principal Scientist responsible for climate archives. He immediately prepared NIWA’s monthly “New Zealand Climate Digest” for January 1993, publicly reporting the 7SS for the first time. As in the 12-year-old thesis, it showed a strong warming trend of approximately 1°C/century. The 7SS trend was driven by the pre-1975 adjustments, taken from Salinger’s unpublished student thesis. It ignored the statistical techniques described in painstaking detail in Rhoades & Salinger – which had been completed in 1992. It ignored all the scientific literature of the 1980s. The 7SS has been updated and used in every monthly issue of NIWA’s “Digest” (more recently “Update”) since January 1993. Its 1°C/century of warming has appeared in the Australia/NZ Chapter of the IPCC’s 2001 and 2007 Assessment Reports. It has been offered as sworn evidence in countless tribunals and judicial enquiries, and provides the historical base for all of NIWA’s reports to both Central and Local Governments on climate science issues and future projections. The same 7SS dominates the discussion of “The New Zealand Temperature Record” on NIWA’s website, as well as NIWA’s printed brochures. No piece of climate lore is more familiar to the public, and it is better known than NIWA’s logo. But now, para 7(a) of NIWA’s Statement of Defence states that “there is no ‘official’ or formal New Zealand Temperature Record”. And this assertion now seems to be quite true insofar as the 7SS was never officially approved by NIWA’s management or board. NIWA also mentions Zheng et al (1997), a peer-reviewed paper written by three NIWA employees about the measurement of the 7SS trend-line. Curiously, that paper thanks Salinger personally – not NIWA – for permission to use the 7SS. (a) “much effort has gone into correcting NZT for changes of site and urbanization effects (Salinger et al. 1993)”. (b) “Salinger et al. (1992) have made considerable efforts to homogenize maximum and minimum temperatures”. So Salinger never parted with his copyright in the 7SS. It was only “licensed” to NIWA – presumably on the basis that the CRI had full access so long as Salinger remained at the helm. This arrangement appears to have been informal – a private deal between Salinger the author and Salinger the NIWA Principal Scientist. In 1999, Jim Salinger updated the 7SS to a 1853-1998 record and hoisted it on to the NIWA website. NIWA claims the updating was checked by others. The trend-causing pre-1975 adjustments were not. After 2000, Salinger spent most of his time in the UK with the WMO and, both there and in New Zealand, became a world-leading proselytizer of AGW (note his frequent appearances and leading roles in the “Climategate” emails released in November 2009). NIWA management eventually worried that his missionary zeal was detracting from work responsibilities and placed him under a media ban. His continued insistence on media contact finally led to his summary dismissal in April 2009. This sparked a long and bitter dispute before the Employment Court, which was reaching its apogee when the Climate Conversation Group and the NZCSC first attacked NIWA’s 7SS in November 2009. Nobody at NIWA could defend the 7SS. They could not identify the adjustments, let alone understand or replicate them. So they turned reluctantly to the dismissed Salinger, as the sole author, owner and interpreter of the series, to help them respond to our criticism. Within a week, he came up with an “Eleven-station Series” (11SS) which was said to prove that the 1°C/century was common to all weather stations, and not just those that Salinger had adjusted. This was a pitiful argument, as has been pointed out at Quadrant Online, but NIWA lapped it up without hesitation. The 11SS became the subject of an instant press release, now has a permanent place on NIWA’s website and is contended, in paragraph 7(b) of NIWA’s Statement of Defence, to form part of the NZTR. So, the picture emerges of an individual scientist who, having first tied himself to “global warming” 35 years ago, became an IPCC pioneer and a leading evangelist for the new and alarming hypothesis. When policymakers sought guidance on where New Zealand temperatures fitted into these theories, they consulted with NIWA. The answer came from Salinger and 1°C/century (the 7SS) was that answer. When a second opinion was sought from the Royal Society, they referred it to a climate committee chaired by NIWA, and the answer was inevitably the same – 1°C/century. When the IPCC needed a regional chapter for the Third and Fourth Assessment Reports, the New Zealand temperature record was provided by NIWA as 1°C/century. When sworn expert evidence was required by planning authorities and the Environment Court, the alarming long-term warming trend of 1°C/century was provided. The apparent history of fast warming had wide ramifications. Coastal standards have been written which assume New Zealand sea levels will rise at a faster rate than the global average. Stormwater pipes are to be enlarged because NIWA advises that New Zealand is warming at a rapid rate. Perhaps this pervasive assurance that New Zealand was warming even faster than the global average led our ETS to attack even more emissions and sectors than any of its global precedents? Jim Salinger’s achievements are the more remarkable when it is seen that the 7SS is not only the sole evidence for the 1°C/century, but it is contradicted by all other available evidence. See NZ temperature record – a brief history. When the NZ Climate Science Coalition lodged an official request for copies of the original 7SS, NIWA were unable to produce any papers at all. In answer to Parliamentary Questions, their minister said the methodology was set out in the 1981 thesis, which was copyright. Then he said that the calculations had been lost through a computer error at the University. The Minister tabled in Parliament some papers showing that a Wellington adjustment was based on altitudes. He later resiled from that. Meantime, the website said the methodology was set out in a Met Service booklet Salinger et al. (1992) – but that paper makes no mention of 7SS and does not discuss adjustment techniques. In February 2010, NIWA produced a 7SS Schedule of Adjustments (SoA), acknowledging that the pre-1975 results were taken from the 1981 thesis. The Schedule mentioned a peer-reviewed journal paper, Rhoades & Salinger(1993) as an authority for identifying change-points in temperature data – but not adjustments. Subsequently, the minister claimed that the 7SS adjustments were themselves based on the methodology of RS93. From April 2010 onwards, the website and the Minister consistently contended that the adjustment methodology described in RS93 was the same as that used for the 7SS. In April 2009, Salinger was summarily dismissed by NIWA and his appeal to the Employment Court was rejected in December. Both NIWA and the Minister recognised that the murky provenance of the 7SS could not be defended without Salinger, and promised that a comprehensive review, and supporting Journal paper, would be undertaken during the 2010/11 fiscal year. In August 2010, the NZ Climate Science Coalition issued Judicial Review proceedings for a declaration that the NZTR was invalid. As mentioned above, NIWA responded that there was no such thing as an NZTR and the 7SS was merely an unofficial research document (with no more status than the 11SS). At this point, it was apparent to all that the emperor’s clothes had melted away. The Salinger 7SS was stone-cold dead. NIWA’s “Review Report” appeared on its website in December 2010. The promised certainty metrics were deferred indefinitely and the Journal paper is to be delayed until June 2012, at the earliest. The Review contained a new and revised 7SS, which was immediately hoisted on the website in place of the Salinger version. It covers a changed period, uses new adjustments and finds different temperature trends at four of the seven stations. See When does an adjustment become a replacement? But it arrives at exactly the same aggregate trend, and is 99% statistically identical. NIWA claims it is a resurrection of the Salinger 7SS and is not to be seen as a substitute. It has the same DNA as the 1981 thesis, and the 2010 SoA. If one of them is wrong then all are wrong. It is known that the Australian Bureau of Meteorology (BoM) reviewed some or all of NIWA’s new station reports, but the contents of those reviews are held secret. Requests under Freedom of Information statutes in both countries continue to be fiercely resisted. Of course, this untoward secrecy arouses deep suspicion. All seven of the new station reports cite the 1981 thesis as an authority. In the Review report, we find a new theory of provenance, with the adjustments in the 2010 SoA now said to be “calculated by Salinger et al. (1992)” using the methodology of RS93. But S92 did not calculate a single adjustment and does not even mention the 7SS. It was printed before RS93 commenced its peer-review process, and suggests methods that were rejected by RS93. The pre-1975 temperatures used by S92 are those set out in the thesis. 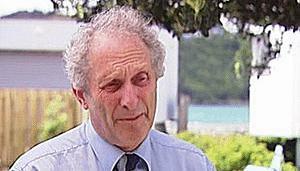 Jim Salinger’s student thesis was contradicted in the year it was submitted; its calculations were lost within three years and have never been re-done; it has never been peer-reviewed, published, critiqued or evaluated by any scientist since 1981 (except members of the NZCSC); the adjustment methodologies and calculations of its 7SS have been recently but wrongly attributed to RS93 and S92; its 7SS temperature trend runs counter to all known archives; the adoption of its 7SS temperature trend by NIWA was authorised by Salinger alone; and only Salinger has attempted to defend it. Now, Jim Salinger has gone from the Government’s payroll. But the 7SS remains – and continues to do its destructive work. An amazing article. Thanks Barry – this is stunning. I didn’t realise that Salinger was an advocate for AGW before he was a scientist. An apparently corrupt and egocentric ‘scientist’, whose legacy has bureaucrats and politicians stonewalling and blowing smoke in typical ‘cover butts’ mode. Excellent history of a very sordid and dishonest affair – thanks, Barry. The walk-away from this silliness has begun, albeit very, very slowly, and while the usual political cya is inevitable, I live in the hope of an outbreak of parliamentary common sense. But I’m not holding my breath while I wait for that to happen. It is an interesting point that the Professor P.D. Jones hemispheric temperature compilations starting with the Jones et al 1986 papers and leading on to CRUT2 which ceased in 2005 – did not find anything like the Salinger warming in NZ. It was only in 2006 when the Hadley Centre authors supplanted Jones and started CRUT3 that NZ warming suddenly increased to be similar to NIWA/Salinger. For those of you interested in the FOI “Wars” – I have just had a reply from the BoM after 20 weeks to my asking them on 31 May for documents from NIWA that would explain the March 2010 Q & A in the Beehive – where on 18 March the Minister said NIWA contacted the BoM re a review. The BoM only have docs starting 30 August 2010. So maybe there is scope in NZ to question the Minister again – or NIWA – and ask for specifics of NIWA contacts to BoM in early 2010 – or whenever the contact was re the BoM review. This six month gap needs explaining. As I understand the blog page, Phil Jones didn’t buy the Salinger adjustments, despite the two being close colleagues over so many years. This seems to be something akin to the “honour amongst thieves” principle, whereby Prof Jones recognised that there had to be some limits to the chicanery allowed to induce warming trends. The two versions of the CRU grid cells don’t precisely cover the New Zealand land area – one excludes the Southern SI (Dunedin)and the other omits the East of the NI (Napier). The 1900-2005 trend was shown at 0.32°C in the first, and 0.4°C in the second. These CRU-adjusted figures are very close to those found in the NZCSC Audit. And then, in 2006, the temperature records were handed over to the Hadley Centre, where Salinger was spending much of his time as an official of the WMO. They quickly came on board and amended the 100-year-old temperatures downwards to create trends of 1.06°C in the first version (cf NIWA 1.06°C) and 0.96°C in the second. So, now the global IPCC figures agree at last with those appearing in the IPPC chapter on Australia & New Zealand.